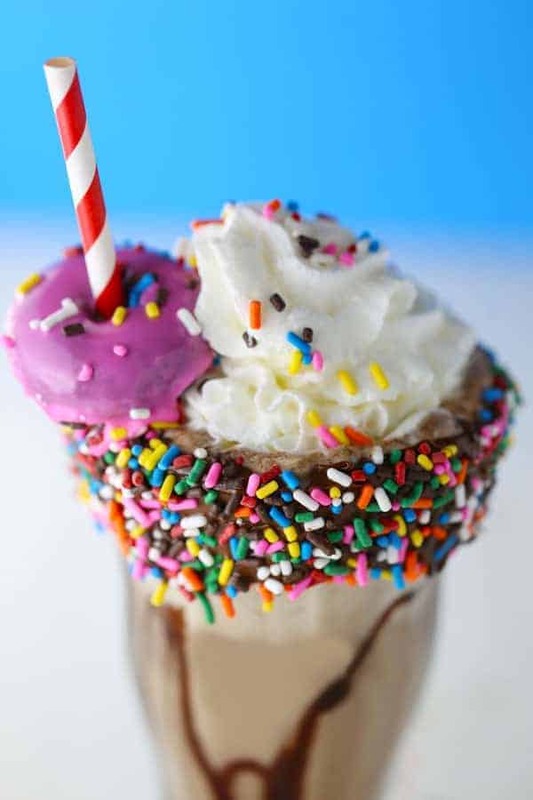 Funfetti Chocolate Mocha Frappuccino is a fun and easy coffee drink made with Dunkin’ Donuts® Coffee. Spring is in the air and the temperatures are finally warming up which makes me crave a cool, refreshing beverage! 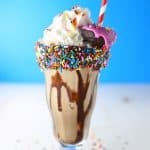 This Funfetti Chocolate Mocha Frappuccino is just the ticket! I like to indulge in a little treat in the afternoon before the kids get home from school. It’s my me-time when I can take a break from my work for a few minutes, enjoy something sweet and watch my favorite show on tv! Making the Funfetti Chocolate Mocha Frappuccino is super simple, starting with this cute little donut garnish. I used store bought mini donuts and dipped them in a homemade glaze, then added sprinkles. The glaze is just powdered sugar and milk, plus some food coloring which is totally optional. Place them in the refrigerator while you whip up your frappuccino. 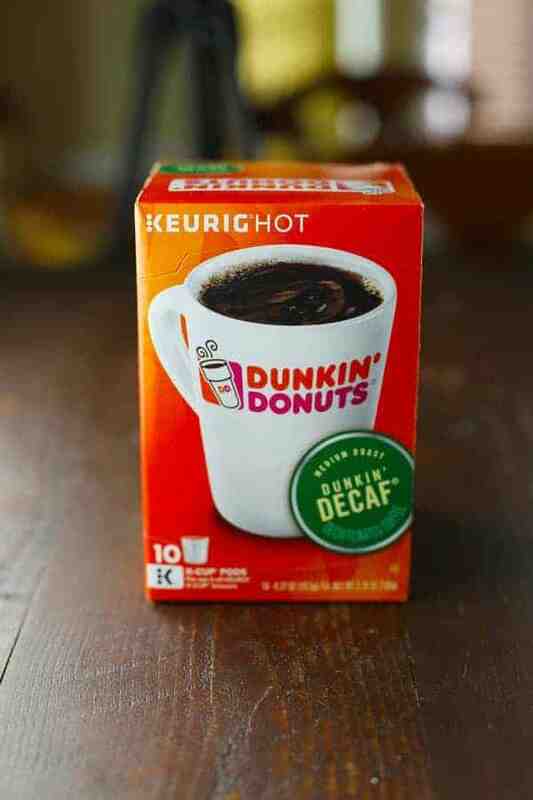 I used Dunkin’ Donuts Coffee for this recipe. It has such wonderful flavor. I really love it! I used DECAF because I don’t do caffeine, but it also comes in regular (of course). The K-Cups are great. 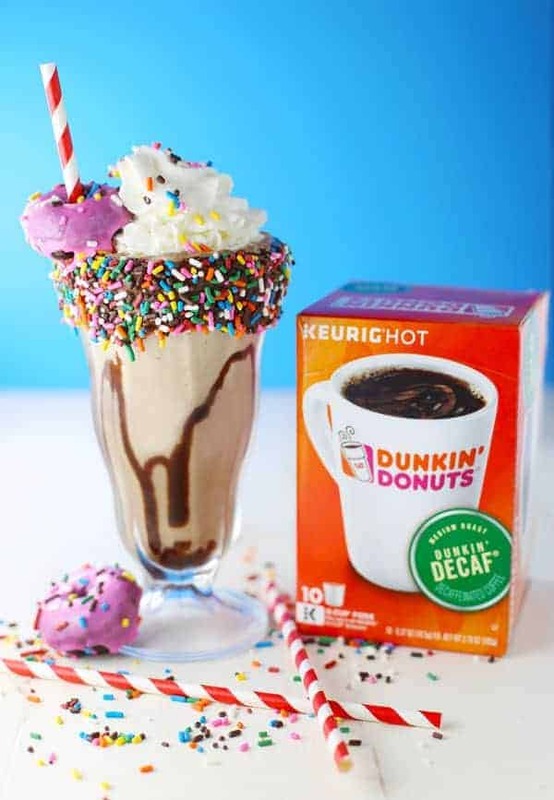 Dunkin’ Donuts offers many varieties, flavors and forms (K-Cup or Grounds). I purchased mine at Publix which is my favorite store. Literally! I think I go there every day! And I’ve got good news. Take advantage of $1.00 off any ONE (1) Dunkin’ Donuts varieties now through 5/6/17 at your local Publix, while supplies last. I brewed the coffee first, so it could cool slightly before making the frappuccino. Next, I prepared the glass. Garnishing the glass is the best part of this recipe! 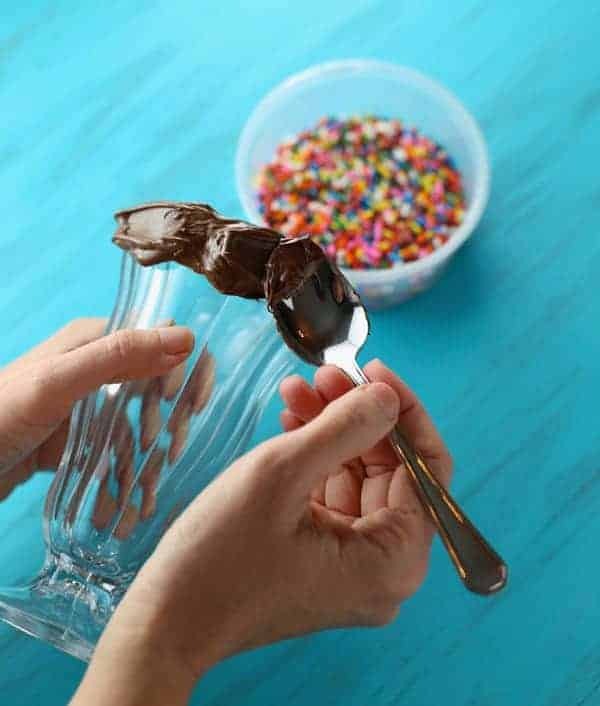 Just spoon some chocolate hazelnut spread around the top edge of your glass. Then whip up your frappuccino. See below for the full recipe. First prepare your garnish. Place powdered sugar, milk and a drop of pink food coloring into a small bowl. Stir until combined. 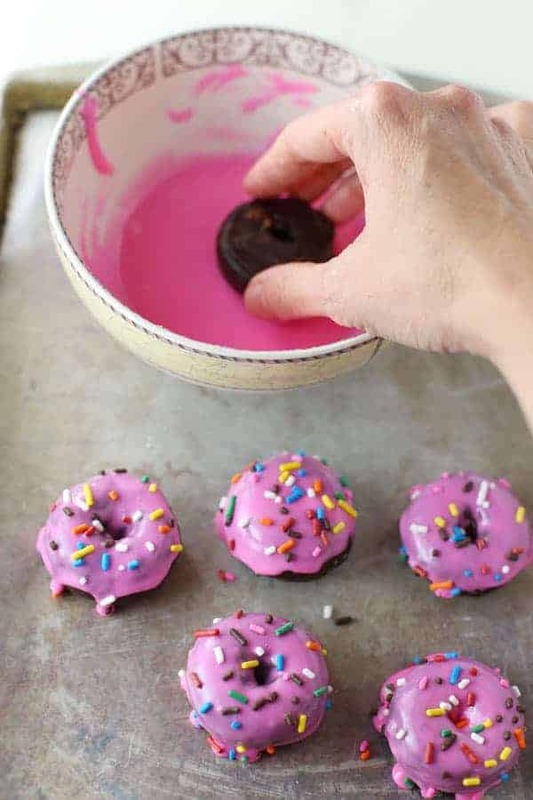 Dip mini donuts in glaze. Add sprinkles. Place on a cookie sheet lined with wax paper and place in the refrigerator to chill. Then garnish your glass. Spoon chocolate hazelnut spread onto the top edge of a large glass. Add sprinkles. Meanwhile, prepare the frappuccino. Add all of the frappuccino ingredients to a blender and blender until smooth. Pour into prepared glass. Add a swirl of whipped cream to the top. 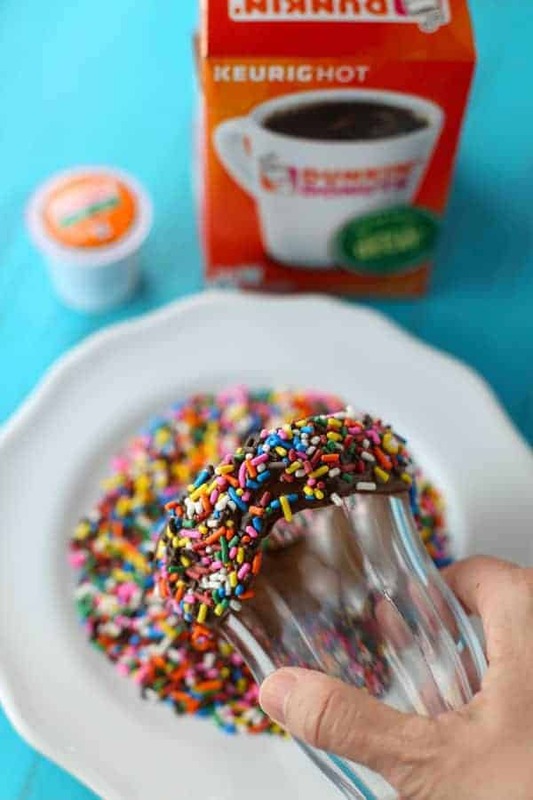 Add more sprinkles and a straw which you place through the middle of a donut. Enjoy more donuts on the side, if desired. This is so fun and love the colors! This is the prettiest drink ever! I&apos;d do it with the caffeine for a pick-me-up in the afternoon and invite a few of the girls over. I realized what good coffee Dunkin Donuts had when they built a store near my house and I noticed the huge line going around the building every day. Everyone was buying a large coffee! Thanks for the cute idea! 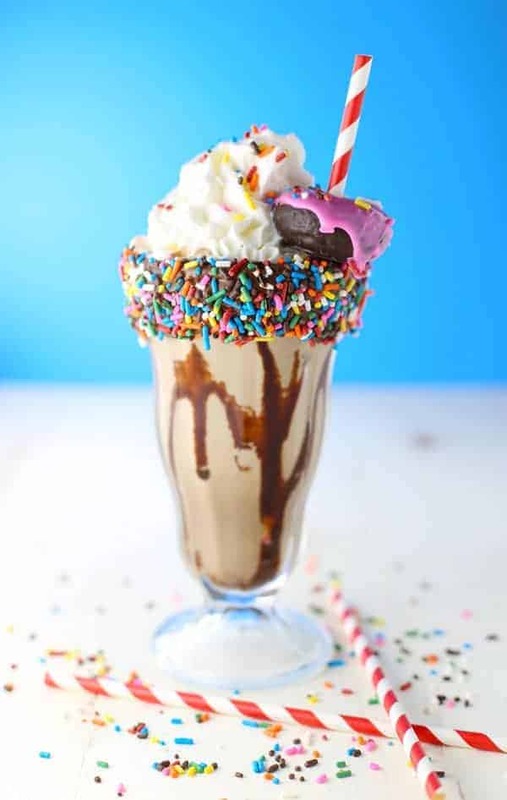 Whoa, so much goodness in a glass! Such a creative idea! So fun and festive!